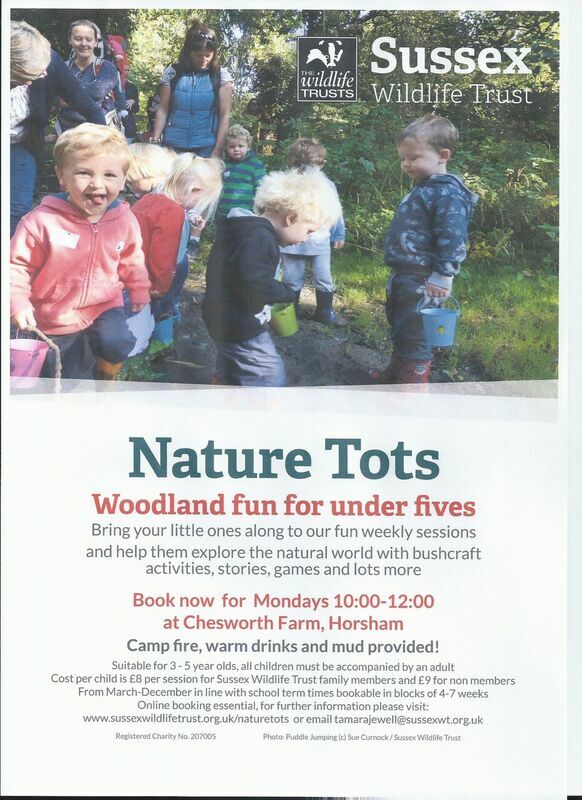 Nature Tots – woodland fun sessions for under fives from Sussex Wildlife Trust @chesworthfarm – is ready for autumn, bringing a whole new set of fun activities. “There is nothing more satisfying than welcoming the change of season whilst warming yourself with hot chocolate by a campfire you have built yourself, ” says Forest School leader Tamara Jewell. “But fire lighting will not be the only new skill to learn! We have lots of exciting plans for these new sessions which will provide opportunities for children to use tools such as saws and drills and learn new crafts. Bring your little ones along to our fun weekly sessions and help them explore the natural world with bushcraft activities, stories, games and lots more. Book now for Mondays 10:00-12:00 at Chesworth Farm, Horsham RH13 0AA. Campfire, warm drinks and mud provided! Suitable for 3-5 year olds. All children must be accompanied by an adult. Numbers 15 maximum. From March-December in line with school term times. Six sessions cost £48 SWT Family Members, £54 non members. Online booking essential, click here for further information on the Chesworth Farm sessions. For more information on Home Education Forest School sessions and how to book your place, click here.